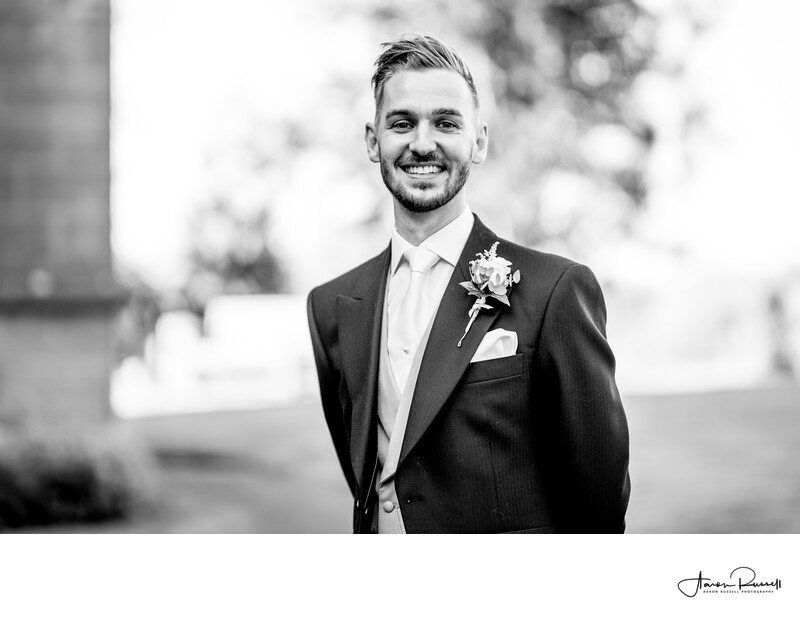 As well as being a professional wedding photographer in Derbyshire, I often get asked to second-shoot for a wedding photographer friend of mine from Worcestershire. 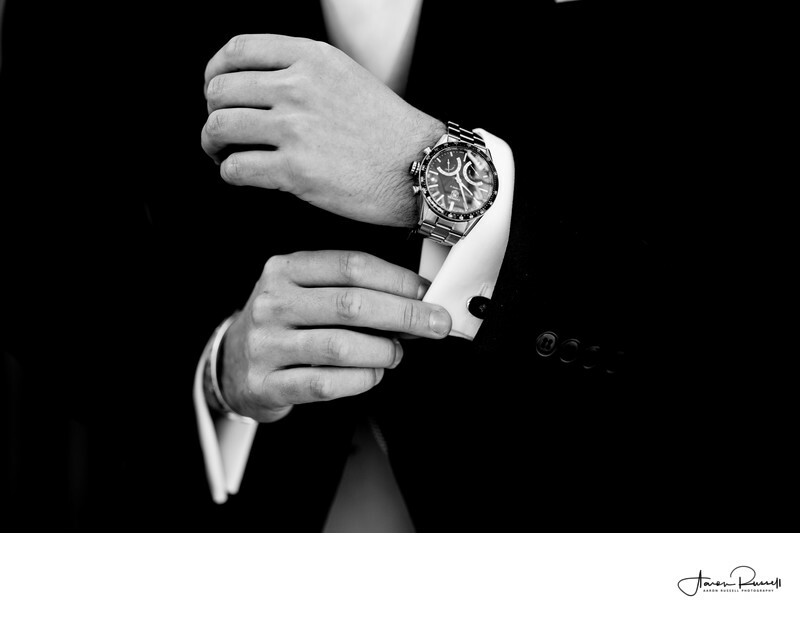 Second shooting is how most wedding photographers start, as it's the only way to build a portfolio. You're able to shoot as you see fit, often without constraints, build a portfolio and all the time there is no pressure on you at all. That's how I started many years ago, but there is still a market for having two wedding photographers at a single wedding. My good friend and mentor, Lee Webb, still uses only me as his second shooter when he gets the call. It's an honour that I still get to work with him after all these years, and I still love second-shooting for all the reasons I used to. Complete creative freedom (as Lee's doing all the hard work!) and I get to approach things from a completely different angle. My morning started with a visit to the groom's home where he and his best man and ushers were well underway with their early morning wedding prep. I arrived just as the boys were making their finishing touches which, if I'm honest, make for the best photos anyway! Taking these amazing photos of the groom making sure his cufflinks are in place, and putting his shoes on were actually taken naturally. Years of experience tells you to be in the right place at the right time, and to take plenty of photos! You might take 30 or 40 photos in a couple of seconds in order to get that one perfect shot, but when you do, it's totally worth it. 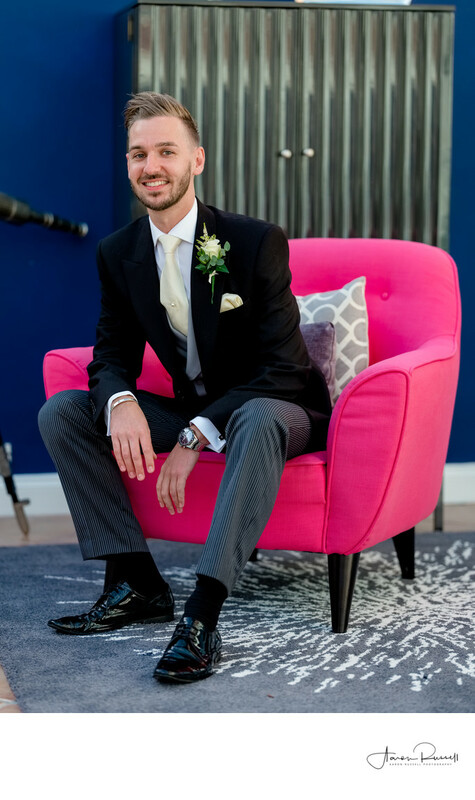 I totally love the look of this image below, especially with how the bright, vibrant pink of the chair stands out against the polar opposite colour of the blue that's on the walls. I caught the groom here in an almost completely natural moment - I could see him sitting and taking a bit of a breather after tying his shoes, and started snapping away. As is often the case when you're trying to remain hidden and take candid photos, I was noticed, and he looked at me and smiled. This is the resulting image, and whilst I usually prefer the subject of my images to not be looking at me when they (hopefully) don't know they're being photographed, it doesn't matter in the slightest here. With some candid shots in the bag it was time to move on to some slight more directed photographs of the groom, his best man and ushers. 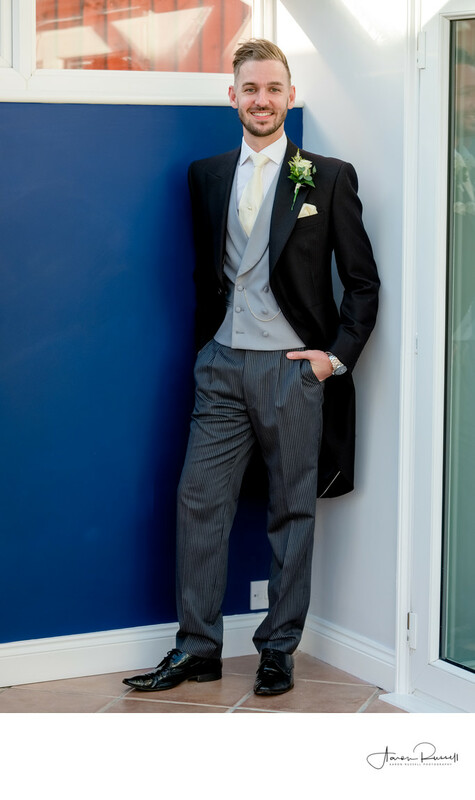 For the first image I went with something fairly relaxed, with the groom leaning against a wall. Again I made use of the bright blue wall to inject a real splash of colour into the image. 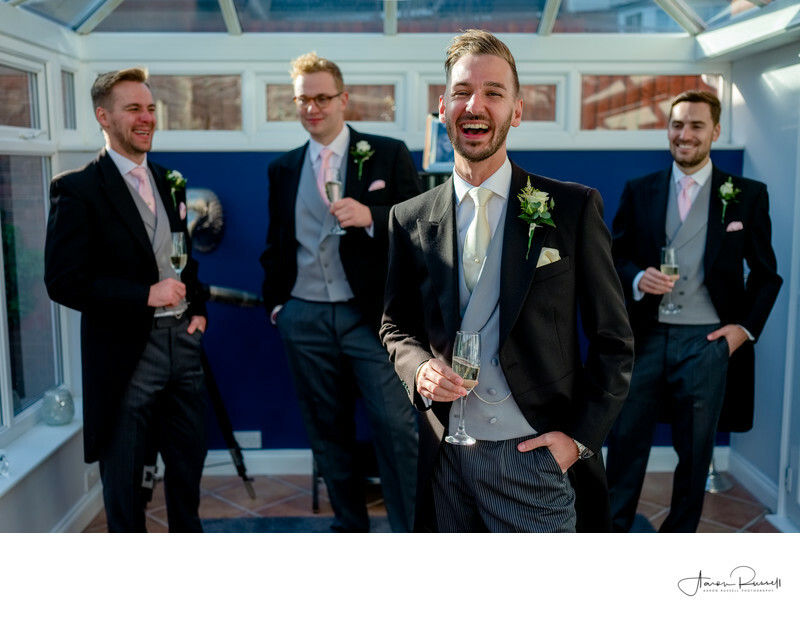 Whilst I was trying to get a photo of the groom with the rest of his groomsmen in the background, they kept falling about laughing which is really no bad thing - if that's how it was on the morning of the wedding, with everyone laughing and joking then that's exactly what I want to show! After a relatively short time with the groomsmen at the groom's house, it was time to drive the short distance to Kempsey Church. It was great being back here, as one of my first weddings with Lee was at this very church, many years ago now! It was nice having the luxury of knowing my way around the venue a little better than I otherwise would have. For my own weddings, I really enjoy taking a look around each venue before I work there. I think it's critically important if I'm new to a venue, as the last thing I want to be doing is finding my way around the place for the first time on a couple's big day. This isn't often a chance I have when I'm second shooting but at Kempsey Church it all came flooding back the second I arrived. 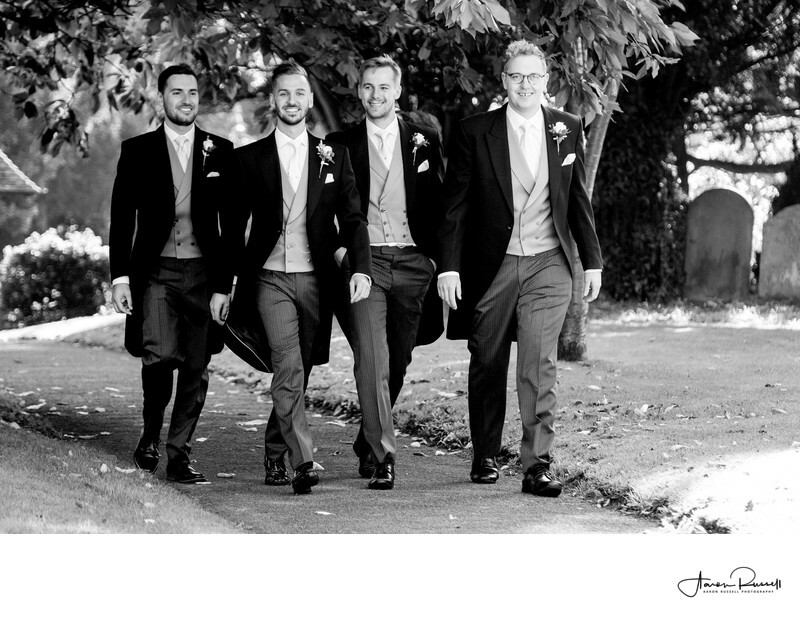 I love this classic shot (above) of the groom and groomsmen arriving at the church. Kempsey Church has two long pathways that lead you into the grounds from the two adjoining roads, either one makes a great place for this sort of photo. Lee has asked me to take a formal portrait of the groom and best man before he arrived, which I was more than happy to do (despite this usually being a job for the primary photographer) and used my medium format camera with 110mm portrait lens to photograph David. I stood him in an area of open shade where the exposure is much easier to control, and shot in such a way that the background behind him was in direct sunlight and therefore a lot brighter. This, when exposed properly means that the background is whitewashed, giving an almost studio-like feel to this photo. The long 110mm portrait lens is perhaps the best lens in the world for this type of photo. On a medium format camera such as mine, the aperture allows for your subject to be in focus, but not much else. This type of portrait photography is really good for engaging the viewer with the subject and removing all other distractions from the scene. Below is a photo of myself that Lee took - I'm still not sure I've forgiven him for it! I always say to my couples that wedding photography isn't all about taking wedding photographs. I mean you can just stand back and let everything happen with no interaction from yourself, but this is how things go wrong and timings start to unravel. I don't know how many weddings I've been to, but it's in the hundreds. Because of this, there's not a lot I don't know how to do when it comes to weddings. If the best man is having trouble attaching his buttonhole flower and I have 30 seconds spare to lend a hand, why wouldn't I? 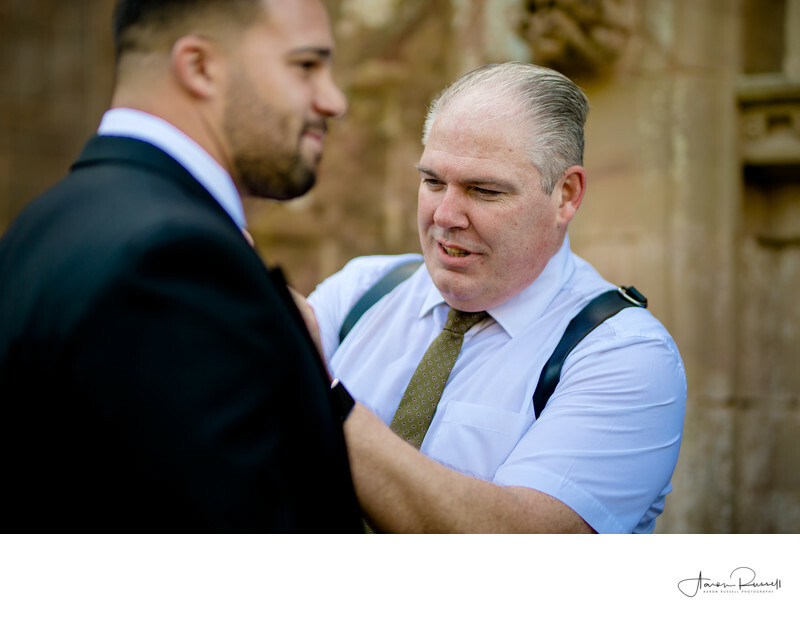 It makes his day easier and the 2 minutes I've saved him in time he can use to help get the guests into the church, allowing the wedding to start when it should, in turn meaning that the time I have for photography after the wedding isn't eaten in to. There's somewhat of a 'snowball' like effect when it comes to weddings. If the bride is 5 minutes late getting into the wedding dress chances are she'll be 10 minutes late to the wedding, which starts 15 minutes after it was meant to, somehow lasting more time that I was originally planned to, with the guests getting to the reception 30 minutes late and all of a sudden I only have an hour to take all of the formal photos and couples photos before the chef kills me because people are late to his wedding breakfast! Saving two minutes early in the day pays dividends later on. The photo below became a modern favourite of mine pretty much as soon as I took it. A couple of the wedding guests were still making their way inside the church when the bride arrived in the wedding car at the main entrance. 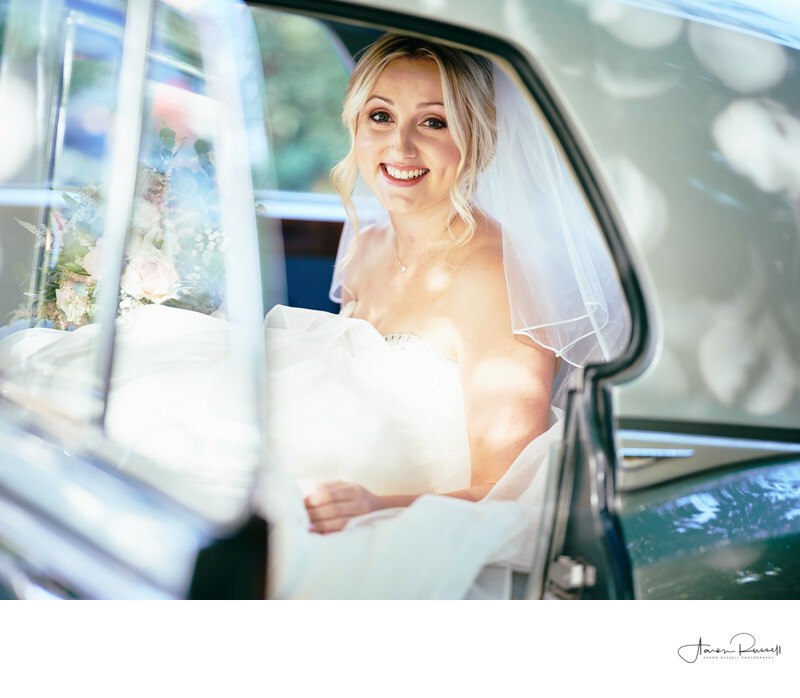 Lee shouted for me to keep the bride in the car, and just as she was about to make her exit from the vehicle I caught her looking out and smiling the biggest smile. I raised my camera, and took a single photo with this being the result. I guess I was lucky to have my medium format camera with the 110mm portrait lens attached as once again it's the perfect took for this job. 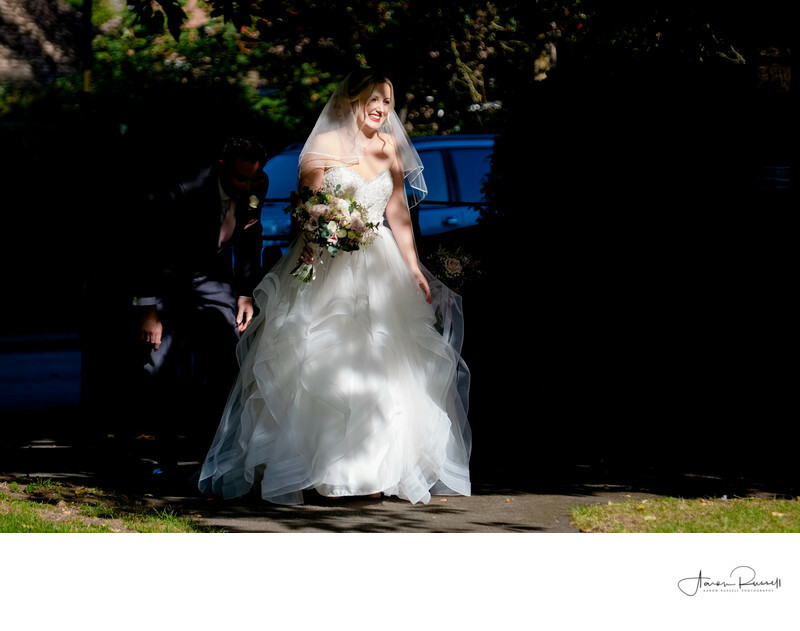 The bright midday sun was hitting the wedding dress directly, and then bouncing around inside the car giving a lovely warmth to the image. The real star of the show is of course the bride and that smile! Lets skip ahead a short while to the wedding service itself. This is one of the key places that having a second wedding photographer really comes in useful. 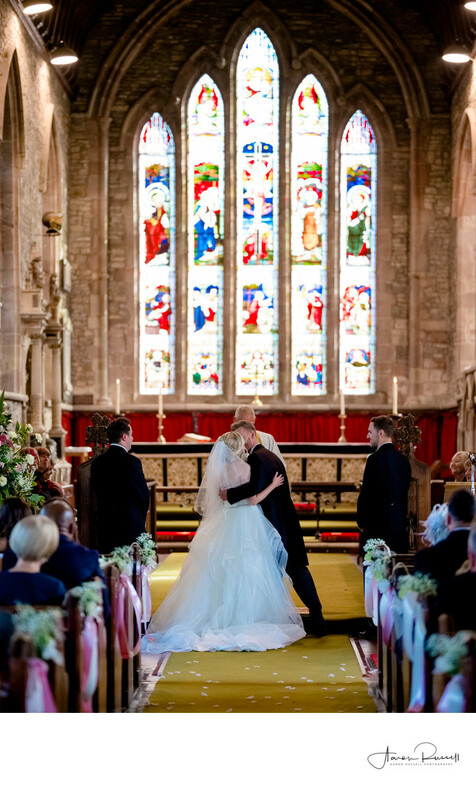 For this wedding, David and Vicky chose to have a full choir present in the church. This in itself doesn't cause a problem, but it does limit the areas in which a photographer can stand at the front of the church and also the line of sight in which they can shoot without getting other people in the image. 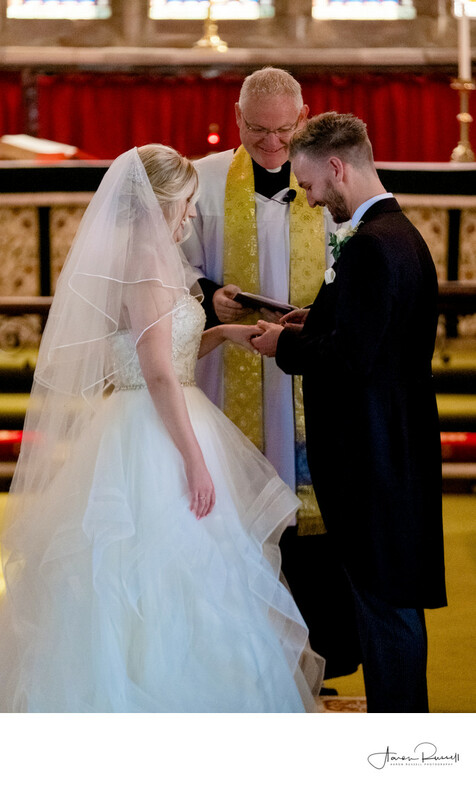 Lee was forced to tuck himself away in the second row of the choir stalls, and whilst still able to capture the images we wanted, you really had to be at the back of the church where I was in order to get a beautiful full-length image such as the one below. Standing here also meant I was able to take photographs with the full stained-glass window in the background. Manor by the Lake is, as the name suggests, a large manor house with it's own lake. The weird thing is though, in order to get to the venue you drive through an industrial estate, with the private drive to the venue leading off a large car park. When you first arrive in the car park of the Manor House, it's hard to know what exactly to expect. Will it be noisy? Will you be looking out onto people's homes and offices? The answer to both of those questions is a resounding 'no.' Manor by the Lake is like an oasis. Once inside the venue you could be literally anywhere (the Derbyshire countryside in which I call home for example.) There's not any indication that you are, in places, only 50 metres from the industrial park. It's quiet, you can hear birds singing and guests laughing. There's not another building in site, and the entire place is just wonderful. 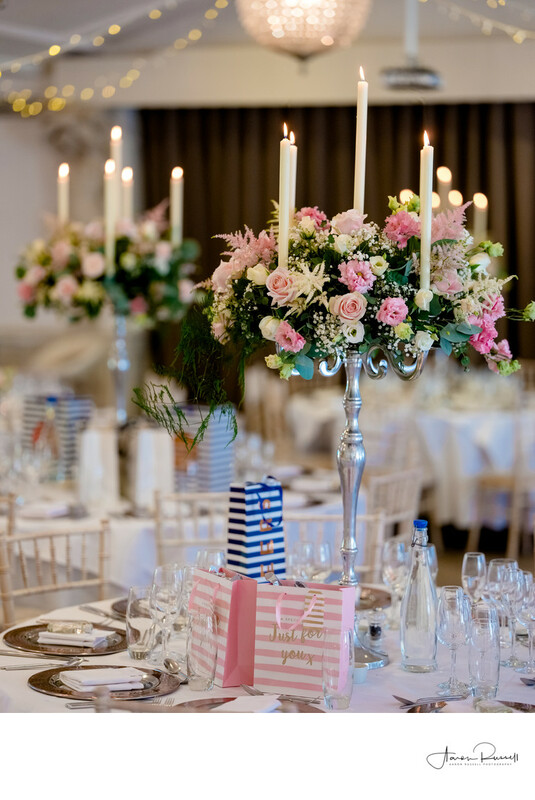 It's like falling through a gap behind your cupboard and ending up in the wedding equivalent of Narnia! 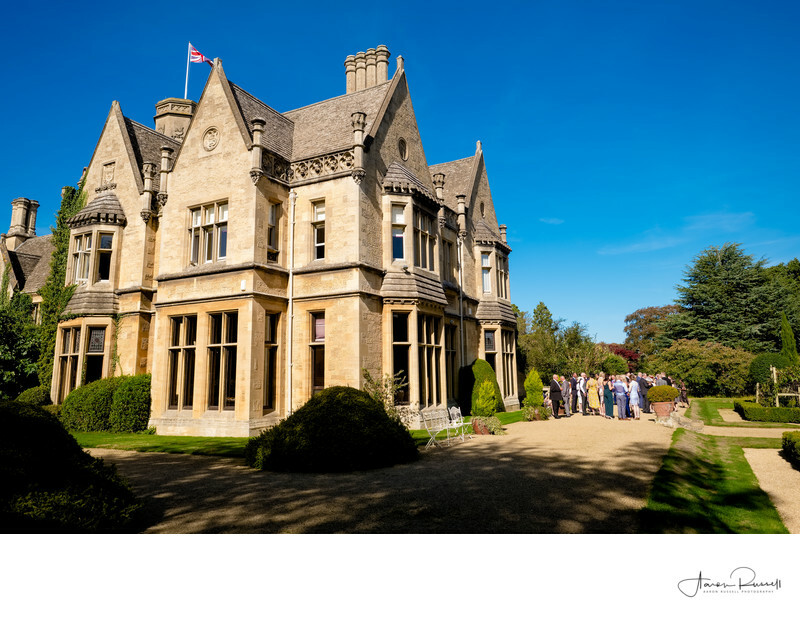 Owing to the slow driving speed of the wedding car, we arrived 5 or so minutes before the bride and groom did, and we filled this time by taking photos of the guests arriving and enjoying themselves as well as having a very quick look around the venue for inspiration. When the wedding car did pull in, the driver asked where and how we'd like the car placed. 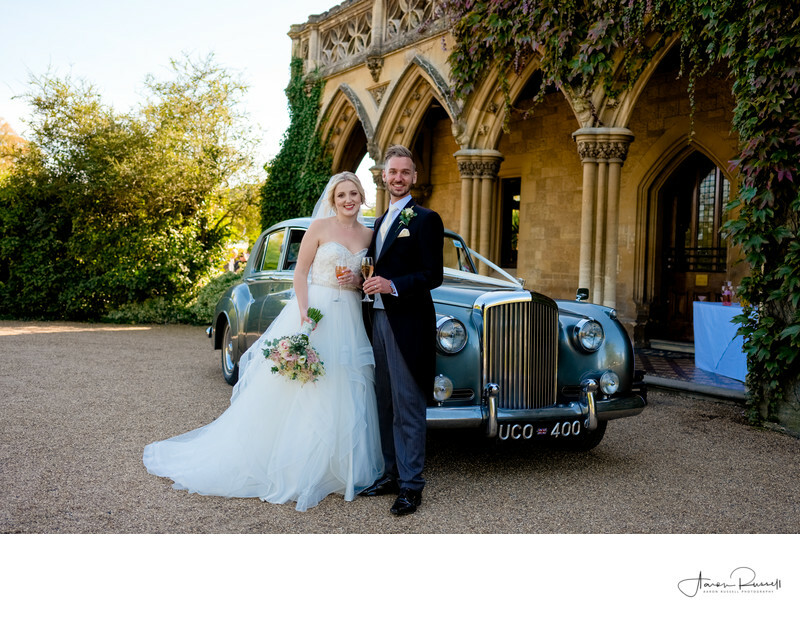 We opted to place the car in front of the main door to the Manor, where we were hoping to set it off against the gorgeous yellow Cotswold stone and the deep green-black ivy that adorns it. We took a couple of images from almost straight on, but I knew there was a better photo to be taken. I moved around to the front of the car, leaving the bride and groom in much the same position as they were for the previous photo. 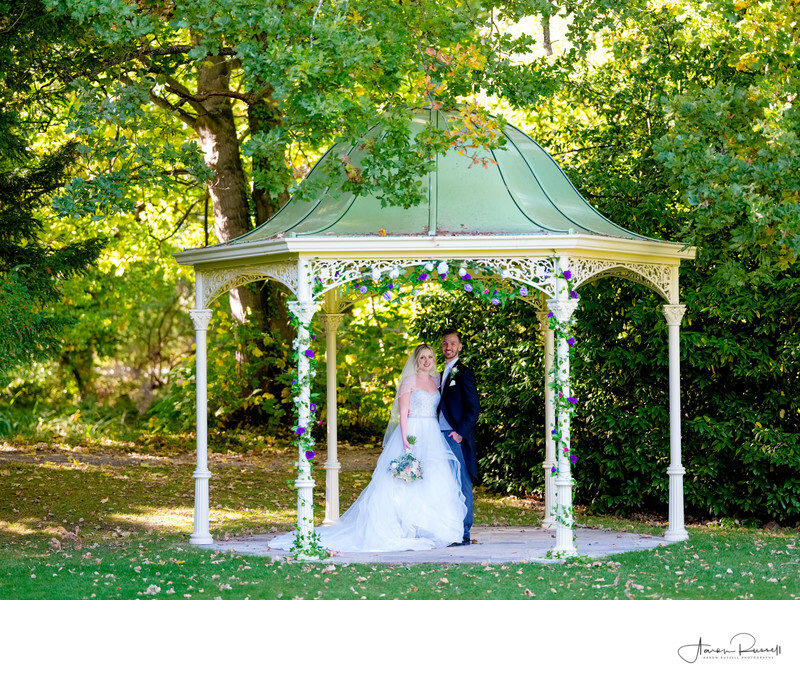 Being in open shade meant that the light was rich and constant and made for a very pleasing wedding photo. As Lee was busy taking the formal group photographs that the bride and groom has requested, I was tasked with photographing the wedding guests enjoying themselves and getting some more general candid photos. This is what I do best! The grounds of Manor by the Lake were large but luckily the wedding guests didn't venture too far and wide. Shooting with my longer lenses I made sure that I remained out of the way and hidden as much as I could, always looking to get the best possible angle on my unsuspecting subjects. As sometimes happens, when we arrived at the venue the staff gave us a very different timetable to the one that had been supplied literally only a few days before. We were told we'd have time to take photos until 3pm, only when we got there this had changed to 2:30pm. Losing half an hour doesn't seem like a lot, but that was 33% of the time we were expecting to have. There was no choice but to split our efforts. Lee chose to take the big group photo of all of the wedding guests which would take around 10 minutes to organise, and I was asked to take the very important photos of the wedding reception room before the guests were invited inside for the breakfast. I always try to put a unique spin on what might otherwise be the 'same old same old' and here I found this huge mirrored table that I knew instantly would make for great foreground interest. 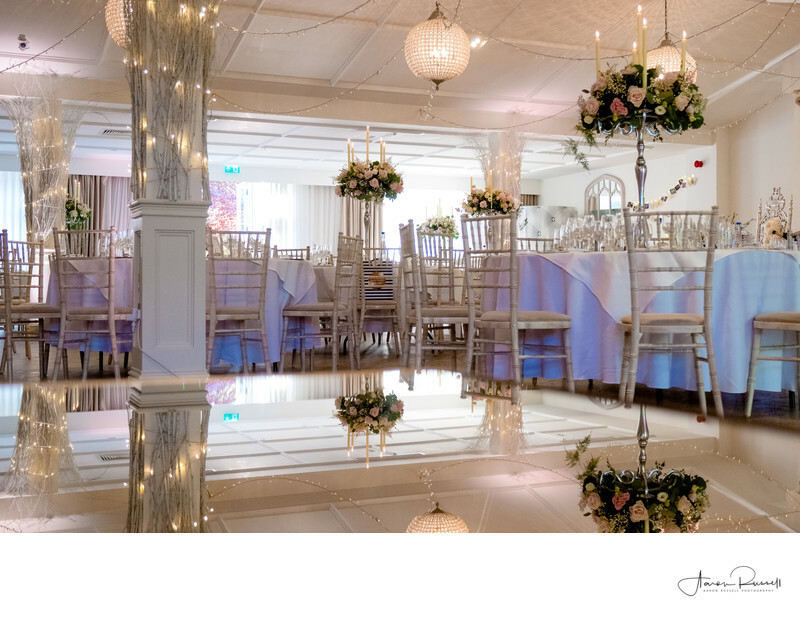 I used the table to my advantage and reflected half of the scene in it's surface, both showing off the venue and making for a really interesting wedding photo. With the photos of the venue in the bag, I met Lee outside for the photos of the bride and groom. I really enjoy this part of the day. For a lot of wedding photographers it's this bit that proves the most stressful as there's a lot of pressure to deliver. Not for me though, this is the one but I really look forward to more than anything else. Being alone with the bride and groom gives you all time to relax and take the day in a little. 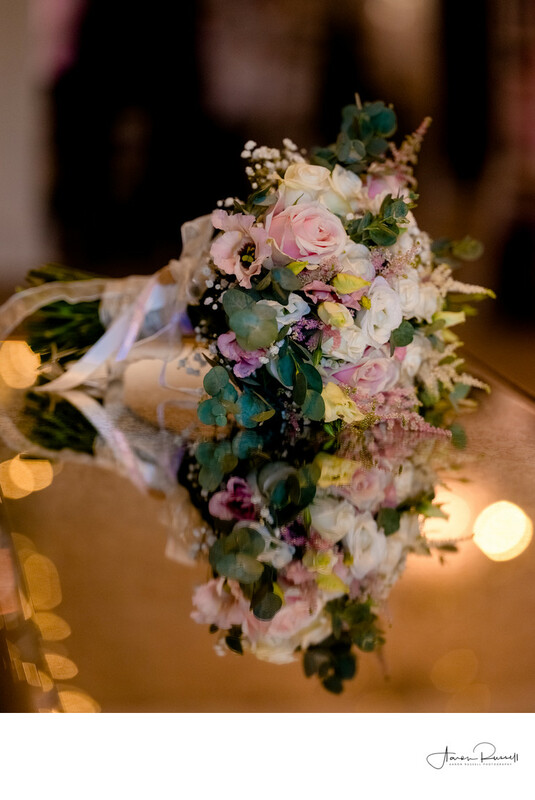 Weddings are hectic and getting away from the guests for 25 minutes is also a welcome relief for both you and the newlyweds! We had discussed on arrival where we wanted to take photos and one of the first places was just by where we had photographed the bride and groom next to the wedding car an hour earlier. The gardens in the background to this image are where we had taken the formal group photos, and to my right was the front entrance to the Manor House. For this photo I wanted again to do something a little different and quickly set up my Profoto B1 portable studio light. I wanted to balance the exposure with the background which was in direct sunlight - this meant that my light had to produce the same power output, relatively speaking, as the sun (of course the sun is 150 million kilometres further away but you get the idea.) The power needed to do this is vast, but my Profoto light, being a whopping 7x more powerful than even the best flashgun was more than up to the task. On we walked about the venue and we came across this pergola in the grounds that is used for outdoor wedding ceremonies at Manor by the Lake (hence the decorations around the one side facing outwards onto the lawn) I took a few photos close in of the bride and groom but it wasn't until I pulled back and shot with a wider lens that the image really started to make more sense. 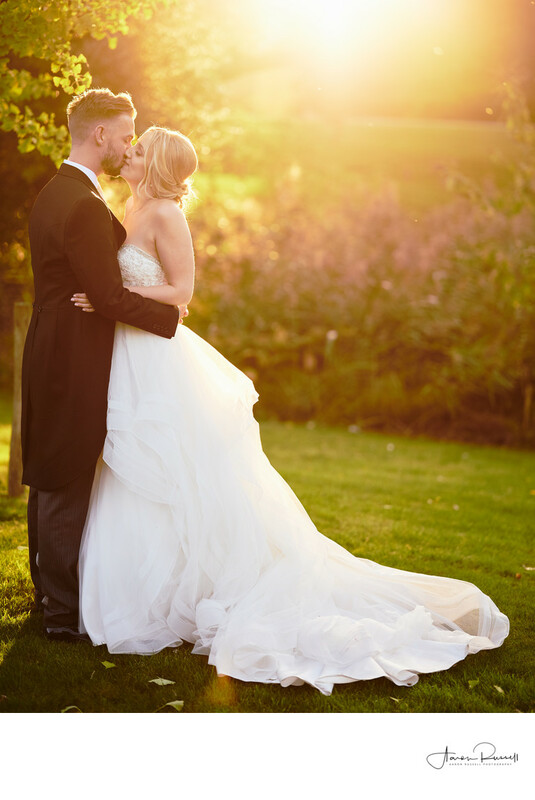 Being October, the sun was already low in the sky which gives this gorgeous yellow-gold light, and the hint of autumn in the background really gives a lot of colour and warmth to the image. When it comes to the speeches it's another great time to have two wedding photographers. Here, one photographer is able to cover the people who are speaking whilst the other is able to capture images of people's reactions. 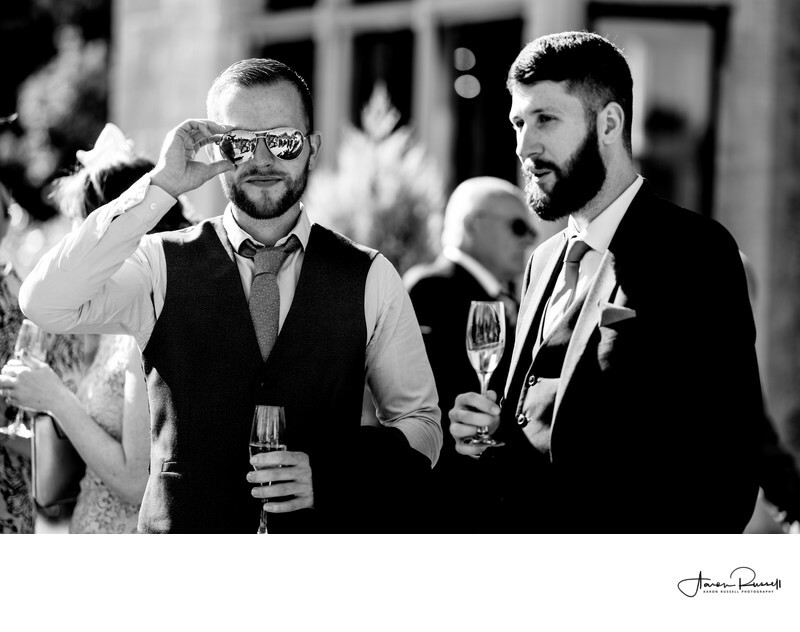 Below is one such photo that I took during the groom's speech, showing an array of very different reactions which is why I like this image so much! 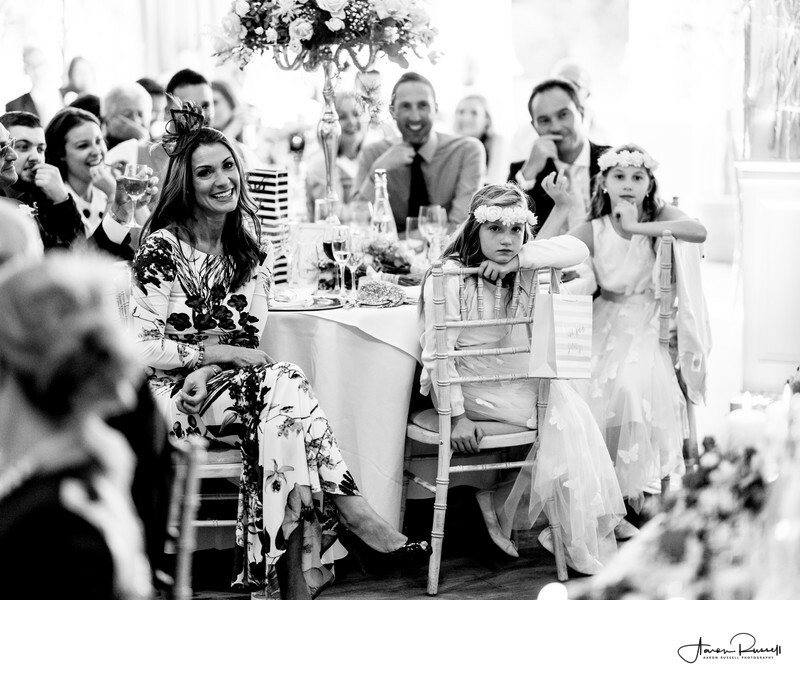 There's a sea of smiles for most people around the table, with the two flower girls looking like they're just waiting for the moment they can get up and party into the night. 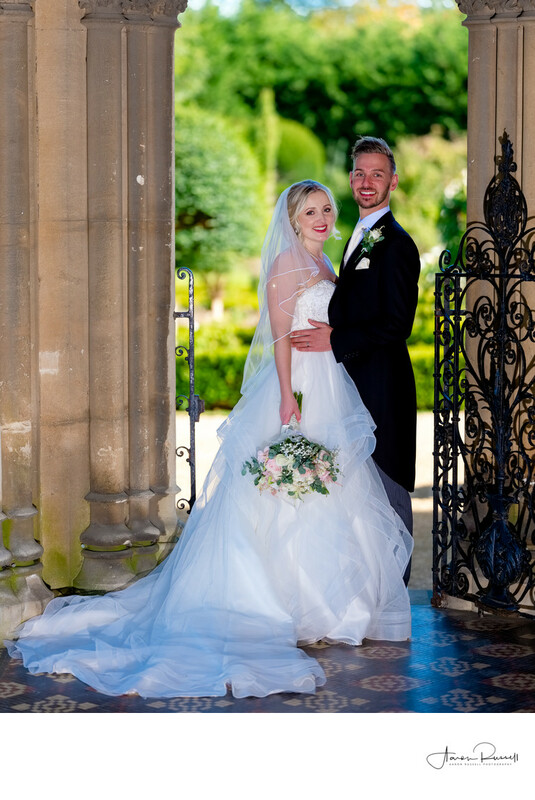 In such a colourful environment as this one is, black and white wedding photography is very effective. As the distraction of colour is removed, it allows you to really focus in on what's actually happening in the images. 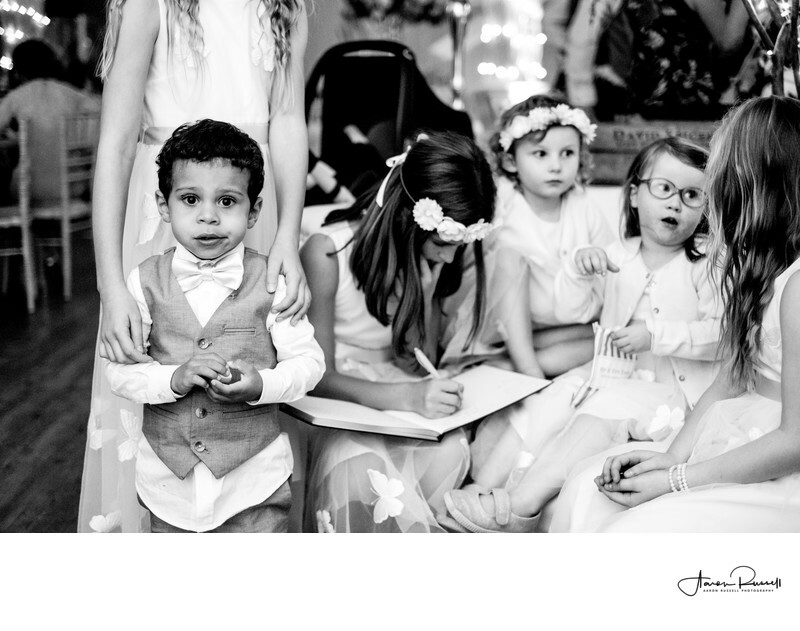 This image below is another absolute favourite of mine from David and Vicky's wedding, I just love the look on the face of the young page boy as he's surrounded by the flower girls who are each doing their own individual thing. The table that I had used in previous photos to show off the venue itself came in useful again when one of the bridesmaids placed the bride's wedding bouquet down on it. I didn't move it at all, instead chose to take some photos with the flowers exactly as they had been laid down. The large globules out of focus light in the background makes for a very pleasing image. 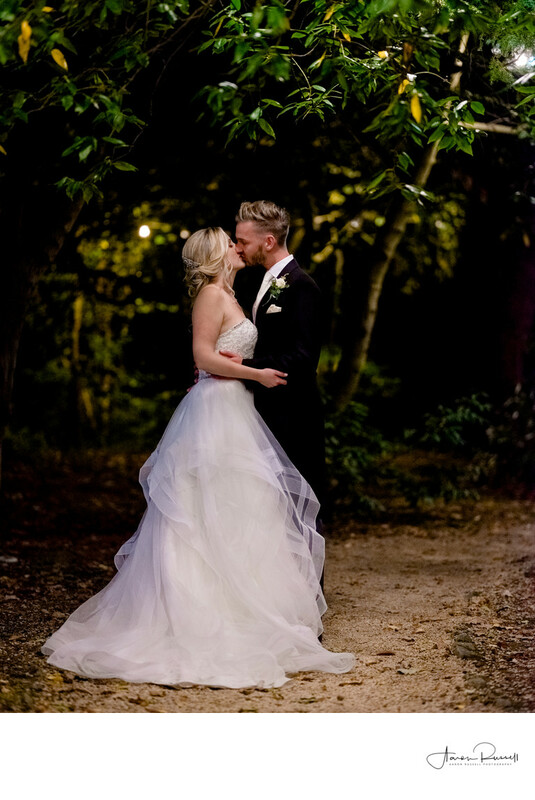 I love taking wedding photos after dark. For many wedding photographer this is where the day is drawing to a close and it's almost easy to start to get a little lazy. You can take some really cool photos however once the sun has gone down and Manor by the Lake is one place that's excellent for this. Around the lake from which the venue takes it's name, there's a long path that navigates through the venue towards the car park which is well lit with large fairy-style lights. There was ample light here to take these photos using only the available light which is always a benefit, making sure the image looks as close to how it actually was on the day as possible.